A physical barrier has the advantage of being permanent (if well designed) and needing minimal effort afterwards to keep the bamboo within. Its drawbacks are the expense of the barrier material, and the labor needed to dig a trench and install the barrier. Barriers may be made of fiberglass sheets, sheet metal, and various other composite materials. It needs to go at least 2' deep and be slanted with the top away from the bamboo side of the barrier. This forces any rhizomes up to the surface where you can see and cut them as they try to get over the top of the barrier. Bamboos tend to be deeper rooted in lighter soils, so if you're on light sandy soil, go down 3' ; if you're on heavy rocky clay, you might get away with 1' to 1.5'. The top of the barrier needs to be 2"- 3" above the soil line so it doesn't get buried by subsequent year's accumulations of leaves and soil and any mulch you might add. Joints in the barrier material need to be securely fastened to prevent the bamboo rhizomes from worming their way through any cracks that might be at the joints. Once installed, all you'll need to do is walk along the barrier once or twice toward the end of summer to spot and cut any rhizomes that are trying to jump over the top of the barrier and, also to make sure all of the barrier top is still exposed above the soil line. The saturated soil along a stream or swamp can serve as a natural barrier that will contain most bamboos, except for possibly Phyllostachys purpurata , which is said to be able to grow into shallow water. Once you've severed off the part of the bamboo grove you don't want, then there are several ways to get rid of the unwanted portion depending on how large an area it covers, what other plants it's growing amongst, and how well established and dense the unwanted bamboo is. Various methods to get rid of it include. 1) Persistently cutting back the top growth until it finally weakens and dies (this will take a couple of months). 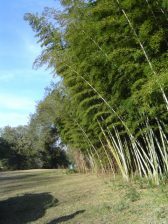 2) Cut it back and use a contact herbicide on the new growth coming up (bamboo is fairly resistant to a lot of herbicides so it may take several applications to kill it out completely). 3) Cut it back and lay black plastic over the area to shade out any new growth coming up (if you do this doing the summer in a sunny spot you're also heat sterilizing to kill any nematodes and weed seedlings that sprout in the upper layer of topsoil). 4) If there only a small amount of escaped bamboo, then just follow and dig up the escaped rhizomes (kind of like following and digging up an underground cable), although if there are a lot of roots in the area this method can become difficult. 5) Cut it back and pen a goat or hog over the area. After a month or two you'll have no bamboo and a fat animal. 6) Cut it back and then rototill or deep plow the area. Then go through with a rake and pick out all of the pieces of rhizome in the turned over soil. Repeat the plowing and picking steps several times to be sure you have gotten all of the pieces out of the ground.